Suppose I were to pick two numbers. I won’t tell you what those numbers are, other than to call them A and B. 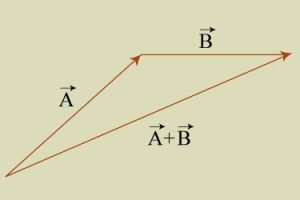 If I asked you what there sum is, A + B, you couldn’t tell me the answer without knowing A and B, but you could tell me one important thing: the answer will be a number. That might seem trivially obvious, but it actually says something important about numbers. Any two numbers when added together will give you a number. That’s because numbers under addition form what is known as a group. Vectors can be added to make another vector. In the physical sciences, lots of things are groups, and this has real physical implications. For example, vectors are groups under addition, so if you add up a number of vectors, the result will be a vector. Since forces are vectors, if you have a number of forces acting on an object you can add them all up to find the total or net force which determines how an object will move. Newton’s laws of motion rely upon the fact that vectors are a group. Basically, a group is any collection of things (numbers, vectors, etc.) that can be connected by some mathematical operation (addition, multiplication, etc.). There are some specific rules that have to be obeyed, but the key is how members of the group are related under their operations. While it seems trivial to say that numbers or vectors are groups, the idea of groups is much more abstract. Take, for example, rotations. A Rubik’s cube demonstrates how rotations are a group. Rotations form a group, where a combination of rotations is equivalent to other combinations of rotations. A Rubik’s cube is a good example of this. If someone scrambles a Rubik’s cube by rotating different parts of it, you don’t need to know what specific rotations they used. Instead you can use a process where you use different methods to return the cube to its unscrambled position. 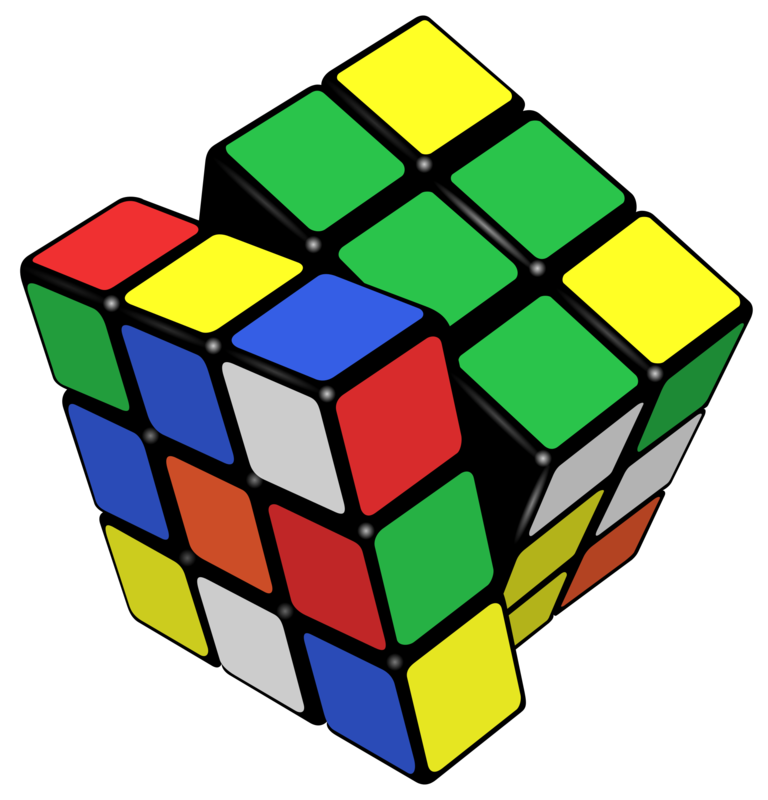 The fact that a Rubik’s cube can be solved is due to the fact the the rotations of the cube form a group. The combinations of rotations you use to solve it are equivalent to the original rotations used to scramble it. Where things get interesting is when you look at the types of things that are always the same within a group. For example, on Earth, locations are defined by their latitude and longitude. Latitude is defined by the angle north or south of the equator, while longitude is defined as the angle east or west of the prime meridian. But suppose we used a different reference frame. Instead of the equator, suppose we started with a different circle around the Earth, for example. The original latitude and longitude are used because they are convenient, but we could use all sorts of coordinate systems if we wanted. In fact, since we could always shift from coordinate system to another, the set of possible coordinate systems is a group. If we shifted from the original coordinate frame to some new one, then our “latitude” and “longitude” would change, but the distance between any two points on Earth wouldn’t change. Mathematically, we could say that distance is invariant under a coordinate transformation. These invariant quantities are related to the symmetry of a group. In terms of the physical universe, they describe the symmetries that exist in the cosmos. For example, imagine a star in the middle of empty space. With no other stars in the area to determine the star’s position, there is a symmetry of motion. If you could take that star and shift it some distance in a particular direction, everything would look exactly the same. This is known as translational symmetry. Mathematically, this means the linear motion of an object is invariant under a change of position. In physics we call this conservation of momentum. It turns out that the mathematical symmetry of space is connected to the physical quantity of momentum. Which brings us to the most brilliant mathematical physicist of all time, Emmy Noether. Emmy Noether used the mathematics of group theory to show that every symmetry within a group that describes a physical phenomenon is connected to a conserved physical quantity. So, translational symmetry means there is a conservation of linear momentum. Rotational symmetry means there is a conservation of angular momentum. Conservation of charge, energy, the connection between electric and magnetic fields, are all the result of group symmetry. This relation is now known as Noether’s theorem, and its power is hard to overstate. What Noether showed was that all the conserved quantities that exist in the Universe exist because of a symmetry that exists within the abstract mathematical concept of a group. Some of the most beautiful and powerful mathematics is physically connected to the way our Universe works. Mathematics doesn’t just describe the world around us. The most basic connections within mathematics describe the bedrock of physical processes. Everything we study within physics depends upon Noether’s theorem, from dark energy to the Higgs boson. It has transformed the way we view the cosmos, and it demonstrates the real power of mathematics when it comes to understanding the Universe. Next time: Given that mathematics is so powerfully central to our understanding of physics, does math tell us what is true about reality? The last part of the series starts tomorrow. A wonderful post, thank you. One nit. I would say Noether is one of the most brilliant mathematical physicists of all time. To say she is THE most brilliant seems an overstatement. For example, Newton invented the Calculus or Maxwell formed the EM equations. Perhaps you might say Noether was one of the two or three most brilliant. It is fascinating to me that every attempt to explain the physical reality of the universe has had to rely on exquisite and abstract notions that intuitive to human cognition in non-physical ways and can be described by the language of mathematics – if there is a lingua franca of the universe – it has to be mathematics. Without mathematics we would have nothing else to describe the universe. Perhaps with the exception of music. (Maybe some other forms of beings could be using music to describe the universe around them – never know, and who knows may be they call that music Mathematics!). Also more critically speaking, perhaps the natural appeal of symmetry whether in math or in music, to our human cognition, is a self fulfilling reality. Perhaps we can only see symmetry and it puts limits on how well we will eventually be able to understand the universe and physical reality around us. And Perhaps that is what creates the seduction around non-physical theories despite the lack of evidence. It’s like we live inside one of those snowflake crystal globes trapped within the limitations of our cognition. And its not so bad. Do we know what is the symmetry that results in constant speed of light for all reference frames?